Take this quick quiz to find out if you should eat organic meat in Phoenix! 1. Do you want to avoid antibiotics and other chemicals in your meat? Organic meats are never given antibiotics, added hormones or steroids. (The overuse of antibiotics in farm animals has contributed to antibiotic resistant strains of bacteria which poses a serious threat to humans.) Additionally, the pastures they graze are also certified organic so there are no herbicides or pesticides in their 100% grass diet. 2. Do you want your meat to provide better nutrition? Organic grass fed beef offers a superior nutritional profile vs. factory farmed, grain fed beef. It is higher in heart healthy Omega3s and lower in unhealthful Omega6s as well as being higher in CLAs and many other nutrients. 3. Do you want your meat to come from humanely treated animals? For meat to be certified organic, the animals must be raised humanely. The practices of the organic rancher are regularly reviewed and audited to ensure compliance with organic standards. 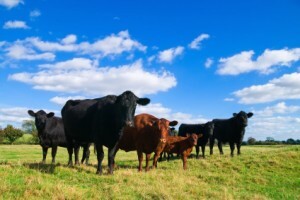 Our organic cattle are raised on the rich green grasses of the Pacific Northwest United States. They have the to roam and graze organic pastures their whole lives, never living in the cramped unsanitary conditions present in factory farm feedlots. 4. Do you want your organic meat to taste better? Organic meat that is also 100% grass fed and finished tastes so much better than factory farmed grain fed beef. It has a more defined beefy flavor than grain finished beef which can be more tender but also more bland. If you answered yes to any of these questions, then you should choose organic meat for you and your family in Phoenix! This entry was written by Jeff, posted on January 23, 2014 at 6:51 pm, filed under Announcements - Cities, Blog and tagged Arizona, beef, grass fed, meat, organic, Phoenix. Bookmark the permalink. Follow any comments here with the RSS feed for this post. Both comments and trackbacks are currently closed.